"Red gold" redirects here. For the tomato processing company, see Red Gold. "White gold" redirects here. For other uses, see White Gold (disambiguation). For the colloquial term white gold, see Sodium chloride. A common white gold formulation consists of 90 wt.% gold and 10 wt.% nickel. Copper can be added to increase malleability. The strength of gold–nickel–copper alloys is caused by formation of two phases, a gold-rich Au–Cu, and a nickel-rich Ni–Cu, and the resulting hardening of the material. The alloys used in jewelry industry are gold–palladium–silver and gold–nickel–copper–zinc. Palladium and nickel act as primary bleaching agents for gold; zinc acts as a secondary bleaching agent to attenuate the color of copper. The nickel used in some white gold alloys can cause an allergic reaction when worn over long periods (also notably on some wrist-watch casings). This reaction, typically a minor skin rash from nickel dermatitis, occurs in about one out of eight people and because of this, many countries do not use nickel in their white gold formulations. Rose gold is a gold and copper alloy widely used for specialized jewelry. Rose gold, also known as pink gold and red gold, was popular in Russia at the beginning of the nineteenth century, and was also known as Russian gold although this term is now obsolete. Rose gold jewelry is becoming more popular in the 21st century and is commonly used for wedding rings, bracelets, and other jewelry. 12K Red gold: 50% gold and 50% copper. Up to 15% zinc can be added to copper-rich alloys to change their color to reddish yellow or dark yellow. During ancient times, due to impurities in the smelting process, gold frequently turned a reddish color. This is why many Greco-Roman texts, and even many texts from the Middle Ages, describe gold as "red". The highest karat version of rose gold is also known as crown gold, which is 22 karat. Eighteen karat red gold may be made of 25% copper and 75% gold. For 18 karat rose gold, typically about 4% silver is added to 75% gold and 21% copper to give a rose color. 14 karat red gold is often found in the Middle East and contains 41.67% copper. High-end flutes are very commonly made of solid rose gold, the most common alloy being 14K. Some gold copper-aluminium alloys form a fine surface texture at heat treatment, yielding an interesting spangling effect. At cooling, they undergo a quasi-martensitic transformation from body-centered cubic to body-centered tetragonal phase; the transformation does not depend on the cooling rate. A polished object is heated in hot oil to 150–200 °C for 10 minutes then cooled below 20 °C, forming a sparkly surface covered with tiny facets. The alloy of 76% gold, 19% copper, and 5% aluminium yields a yellow color; the alloy of 76% gold, 18% copper and 6% aluminium is pink. Green gold was known to Lydians as long ago as 860 BC under the name electrum, a naturally-occurring alloy of silver and gold. It actually appears as greenish-yellow rather than green. Fired enamels adhere better to these alloys. Cadmium can also be added to gold alloys but there are health concerns regarding its use. The alloy of 75% gold, 23% copper, and 2% cadmium yields light-green 18-karat gold. The alloy of 75% gold, 15% silver, 6% copper, and 4% cadmium yields a dark-green alloy. Gray gold alloys are usually made from gold and palladium. A cheaper alternative which does not use palladium is made by adding silver, manganese and copper in specific ratios to the gold. All the AuX2 intermetallics have crystal structure of CaF2 and therefore are brittle. 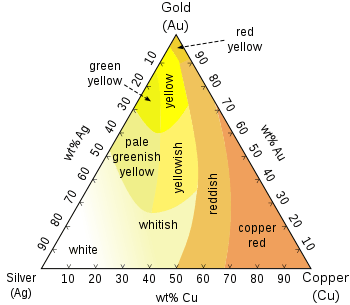 Deviation from the stoichiometry results in loss of color. Slightly nonstoichiometric compositions are however used, to achieve a fine-grained two- or three-phase microstructure with reduced brittleness. A small amount of palladium, copper or silver can be added to achieve a less brittle microstructure. The intermetallic compounds tend to have poor corrosion resistance. The less noble elements are leached to the environment, and a gold-rich surface layer is formed. Direct contact of blue and purple gold elements with skin should be avoided as exposure to sweat may result in metal leaching and discoloration of the metal surface. Blue gold is an alloy of gold and either gallium or indium. Gold-indium contains 46% gold (about 12 karat) and 54% indium, forming an intermetallic compound AuIn2. While several sources remark this intermetallic to have "a clear blue color", in fact the effect is slight: AuIn2 has CIE LAB color coordinates of 79, −3.7, −4.2 which appears roughly as a greyish color. With gallium, gold forms an intermetallic AuGa2 (58.5% Au, 14ct) which has slighter bluish hue. 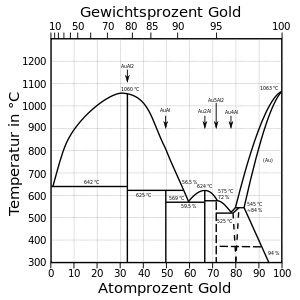 The melting point of AuIn2 is 541 °C, for AuGa2 it is 492 °C. AuIn2 is less brittle than AuGa2, which itself is less brittle than AuAl2. A surface plating of blue gold on karat gold or sterling silver can be achieved by a gold plating of the surface, followed by indium plating, with layer thickness matching the 1:2 atomic ratio. A heat treatment then causes interdiffusion of the metals and formation of the required intermetallic compound. For the colloquial term black gold, see crude oil. 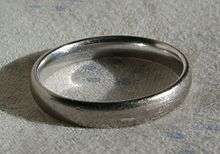 Electroplating, using black rhodium or ruthenium. Solutions that contain ruthenium give a slightly harder black coating than those that contain rhodium. Patination by applying sulfur- and oxygen-containing compounds. Controlled oxidation of gold containing chromium or cobalt (e.g. 75% gold, 25% cobalt). A range of colors from brown to black can be achieved on copper-rich alloys by treatment with potassium sulfide. Cobalt-containing alloys, e.g. 75% gold with 25% cobalt, form a black oxide layer with heat treatment at 700–950 °C. Copper, iron and titanium can be also used for such effect. Gold-cobalt-chromium alloy (75% gold, 15% cobalt, 10% chromium) yields a surface oxide that's olive-tinted because of the chromium(III) oxide content, is about five times thinner than Au-Co and has significantly better wear resistance. The gold-cobalt alloy consists of gold-rich (about 94% Au) and cobalt-rich (about 90% Co) phases; the cobalt-rich phase grains are capable of oxide-layer formation on their surface. More recently, black gold can be formed by creating nanostructures on the surface. A femtosecond laser pulse deforms the surface of the metal, creating an immensely increased surface area which absorbs virtually all the light that falls on it, thus rendering it deep black, but this method is used in high technology applications rather than for appearance in jewelry. Oxide layers can also be used to obtain blue gold from and an alloy of 75% gold, 24.4% iron, and 0.6% nickel; the layer forms on heat treatment in air between 450–600 °C. A rich sapphire blue colored gold of 20–23K can also be obtained by alloying with ruthenium, rhodium and three other elements and heat-treating at 1800 °C, to form the 3–6 micrometers thick colored surface oxide layer. Wikimedia Commons has media related to gold-containing alloys. ↑ Encyclopædia of Chemistry,theoretical, Practical, and Analytical: As Applied to the Arts and Manufactures. J. B. Lippincott & Company. 1880. pp. 70–. 1 2 3 4 5 6 7 8 9 10 11 12 Cretu, C.; Van Der Lingen, E. (1999). "Coloured gold alloys". Gold Bulletin. 32 (4): 115. doi:10.1007/BF03214796. ↑ Arista Flutes. Flute Specialists, Inc.
↑ Mead, M. N. (2010). "Cadmium confusion: Do consumers need protection?". Environmental Health Perspectives. 118 (12): a528–34. doi:10.1289/ehp.118-a528. PMC 3002210 . PMID 21123140. 1 2 3 4 Klotz, U. E. (2010). "Metallurgy and processing of coloured gold intermetallics — Part I: Properties and surface processing" (PDF). Gold Bulletin. 43: 4. doi:10.1007/BF03214961. Archived from the original (PDF) on July 26, 2011. 1 2 3 "Gold In Purple Color, Blue Color And Even Black Gold". kaijewels.com. ↑ "Jewelery Technology". World Gold Council. Archived from the original on March 3, 2006. ↑ Rapson, W. S. (1978). Gold Usage. Academic Press. ISBN 0-12-581250-7. ↑ "Ultra-Intense Laser Blast Creates True 'Black Metal'". Retrieved 2007-11-21.